Demand tends to be more price inelastic in the short-run as consumers don’t have time to find alternatives. In the long-run, consumers become more aware of alternatives. Price elasticity of demand measures the responsiveness of demand to a change in price. Demand is price inelastic if a change in price causes a smaller % change in demand. This gives a low PED <1. 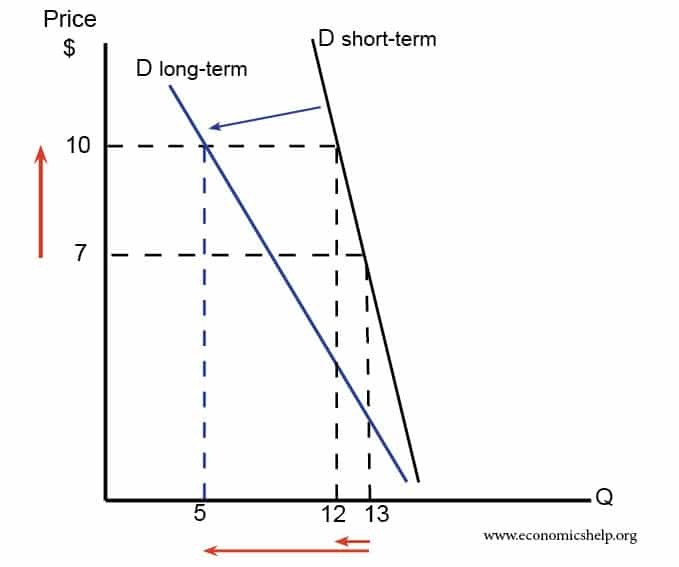 In the short run demand is likely to be more inelastic (low = less than 1). If people are used to buying a good, then when the price goes up, they will tend to keep buying it out of habit. However, when they realise the price rise is permanent they will expend more energy and time in looking for alternatives. Therefore, over time, people are more likely to find alternatives and demand will fall more. If the price of a good is expensive for a considerable time period, consumers looking to save money will start trying to find alternatives. If the price of oil increases people with petrol cars will still buy petrol. However, over time people may increasingly start to buy cars which use alternative energy sources such as natural gas, hydrogen or solar panels. But it will take time to make the switch. Therefore, demand will be more elastic over time. Also, the increase in the price of Windows should act as a signal (it is more profitable) to other firms to develop alternatives. If more alternatives come on the market, demand will become more elastic. This is what happened. In the 1980s, Microsoft had strong monopoly power and was able to increase prices. But, other time, consumers have migrated away from Windows to cheaper software. This entry was posted in concepts and tagged elasticity. Bookmark the permalink. assume that the price elasticity of demand for oil is 0.2 in the short run and 0.8 in the long run. to raise the price of oil by 10% in the short run,what must decreased in the quantity of oil? in the long run, to have 10% rise in the price, what must the decrease be?please help! there would be a two per cent decrease in quantity demanded in the shortrun and an eight per cent decrease in quantity demanded in the longrun.